This hearty pasta only requires 20 minutes of prep, and even less oven time. 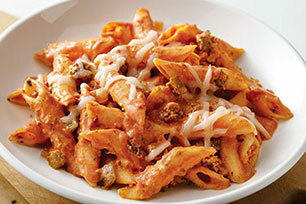 Comfort food at its best, this bake has it all - penne, ground beef, vegetables, a creamy tomato sauce and melted cheese. Mix cream cheese product and milk until blended. Cook pasta as directed on package, omitting salt. Meanwhile, brown meat with vegetables in large nonstick skillet on medium heat. Add cream cheese mixture, pasta sauce and 1/2 cup mozzarella; cook and stir 2 to 3 min. or until mozzarella is completely melted. Drain pasta. Add to meat mixture; mix lightly. Spoon into 2-L casserole dish sprayed with cooking spray; top with remaining mozzarella. Cover. Bake 15 min. or until heated through, uncovering after 10 min. Substitute Italian sausage for the ground beef. Prepare using your favorite flavour of pasta sauce, such as marinara, mushroom or garden vegetable.